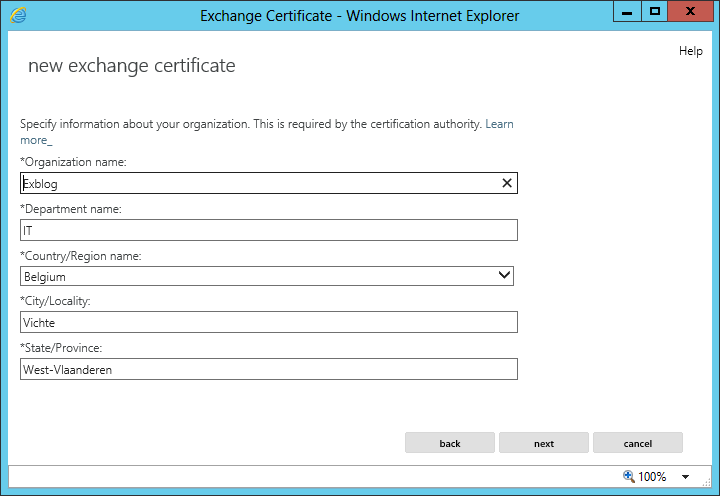 One of the tasks you will have to complete after installing Exchange Server 2013 is configuring certificates. Most Exchange-related traffic (including client traffic) is handled via HTTPS and thus they require some additional configuration to work properly. 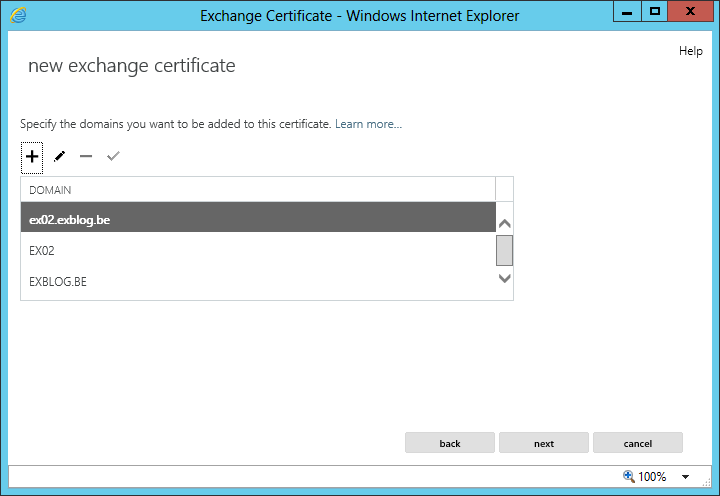 Out of the box, Exchange Server 2013 will be using self-signed certificates. While these certificates (and the associated error messages) might be acceptable in a test-lab, they won’t be in production. 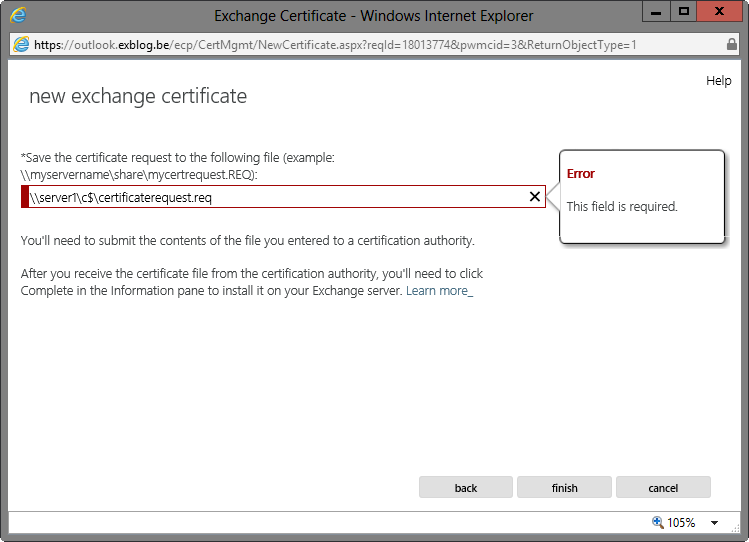 Although there is already a lot of guidance on this topic for Exchange Server 2010, I still regularly come across issues because of wrongly configured certificates. Hence, I decided to create this article to somewhat clarify the subject. What certificates can I use? 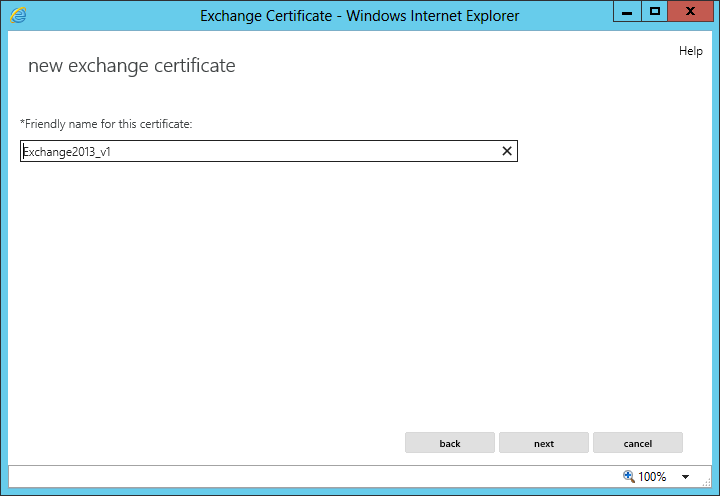 As in Exchange Server 2010, Exchange Server 2013 can use both SAN certificates (recommended) or wildcard certificates. What namespaces should I use? The change in the client access model in Exchange 2013 (RPC over TCP to RPC over HTTP) has a positive impact on the design of your namespaces: ultimately, you need less namespaces then before. * Whether or not you need the Failback URL, depends entirely on the setup of your environment. I will discuss the design and setup of an highly available Exchange Server 2013 environment in another article soon. If you aren’t re-using a certificate that you exported from another server earlier, you will have to create a new certificate request first. This request will provide you a DSR which you can use to generate the actual certificate. If you want to use a wildcard certificate, click the checkbox and enter your root domain. Then click Next. After having clicked Next, you can manually add or remove namespaces to be included on the certificate. Once ready, click Next. Enter your organization details and click Next. 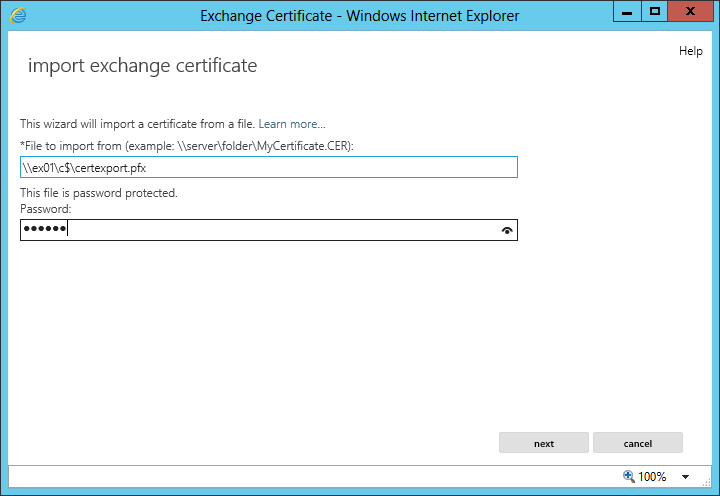 Before continuing, verify that the certificate request file has correctly been created. 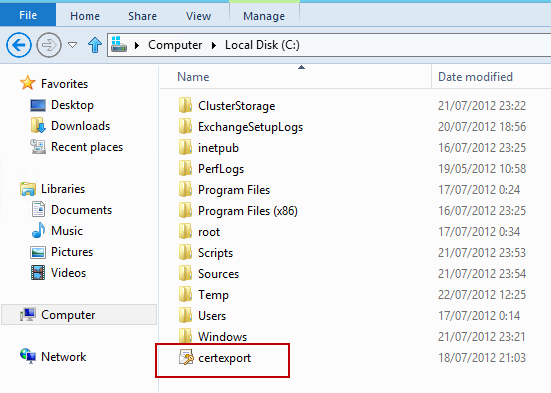 The file will contains a DSR which you can use to request your certificate from your CA. This CA can be a private of public one. Once you have received the certificate from your CA, we can now continue to configure the certificate. Although the certificate has been installed on the server, it has not been activated yet. 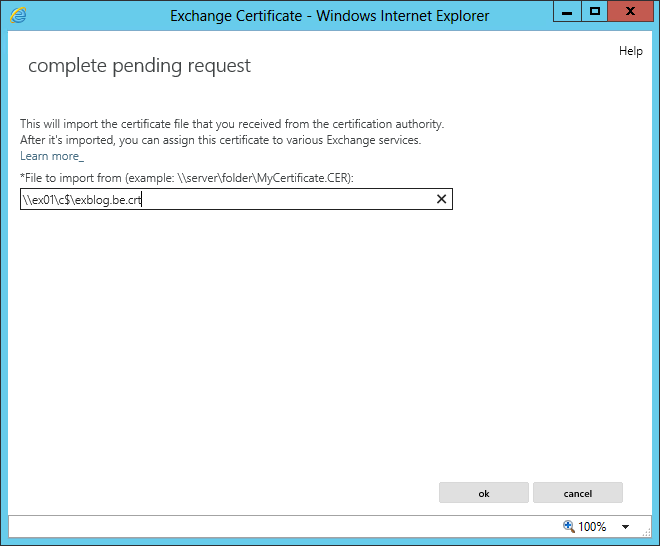 Before a certificate is used, you need to assign services to it. Verify that the certificate is installed and configured correctly by browsing to Outlook Web App. This should not throw a certificate warning. If there is a certificate warning, either something went wrong or your certificate does not contain all the namespaces you’re using. If you have multiple servers, you can either repeat the process above for each server or if you will be using a single certificate for all servers (e.g. when using a wildcard certificate), you should import this newly added certificate on other servers. Next, you will have to import the certificate on each server that will be using the certificate. All that’s left to do now, is to assign services to these certificate on each server. The process is identical as described before. cn= represents the common name of the certificate. DomainName represents the (Subject Alternative) Names to be included on the certificate. 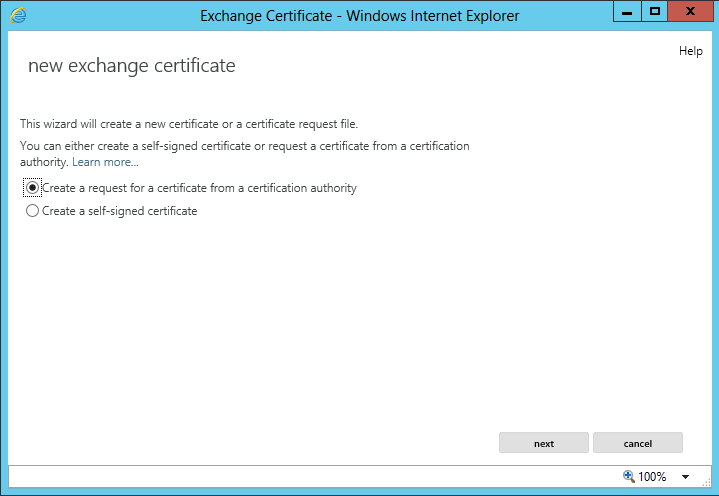 Note While enabling the certificate you will get a warning that this will actually overwrite the existing certificate. You can safely overwrite the default self-signed certificate. Note when running the first command, you will be prompted for a username and password. You can type whatever you want for the username, as this value will be ignored. However, remember the password as you will be using it later to import the certificate into another server. Note you will be prompted for a username and password. You can type any value for the username, but the password should match the one you selected earlier while exporting the certificate. 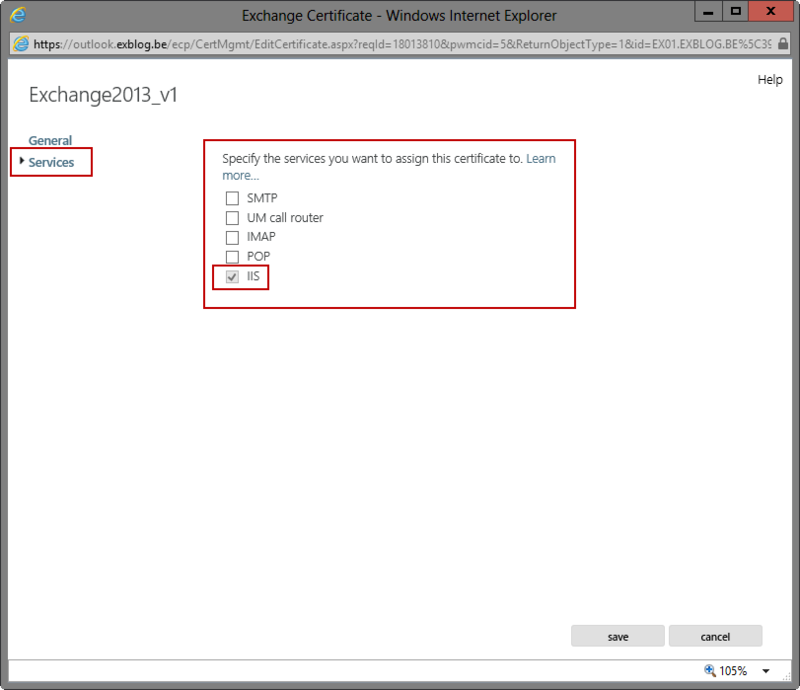 Our exchange 2013 setup didn’t accept the GUI-way of setting the certificate for IIS. 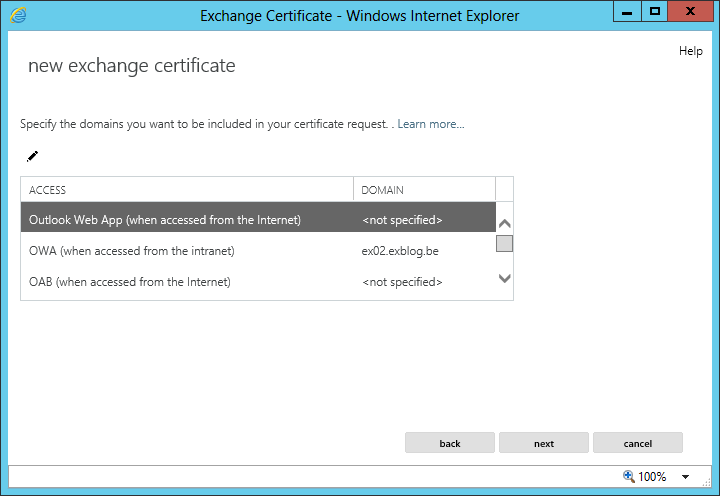 The IIS option is checked, but visiting webmail shows the wrong certificate used. The Powershell command described below worked for us.